As a broadcasting nut (mostly because of my personal and professional addiction) I have been fortunate enough to hear and see some amazing things on television. Each makes you feel something whether it was the horrible OSCAR telecast with Rob Lowe and Snow White, the Challenger Disaster which I watched live in my dorm room as it happened or even the final shows of countless TV programs that I used to watch. Many of us watched the last Tonight Show with Johnny Carson (and Jay Leno – twice- and Conan O’Brien- also twice). Not so much for today’s generation but for mine, Late Night television has been something special (even when it was bad). But Johnny- as great as the show was- was not of my generation. I caught that train somewhere in the late 70s when it was already established but still in its 90 minute format. But then came this fellow that Carson mentored, David Letterman. I remember first seeing Dave on something like Don Kirschner’s Rock Concerts as a stand- up comedian. I didn’t think he was particularly funny. Then somehow Letterman ended up with a morning show on NBC. I caught that for a while and just thought the whole episode was awkward, although towards the end some of the bits were funny because clearly they didn’t care any more. But Carson decided he wanted Letterman as part of the new 12:30 am slot. 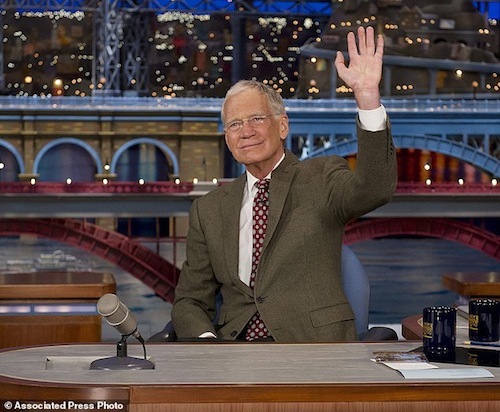 Given lots of rules that would differentiate it from The Tonight Show, Late Night with David Letterman debuted and television was not quite the same after that. It was unique mostly because Late Night had to twist the talk show format to suit Carson. It was a wise move for Carson and ultimately for Late Night. Dave and his writers came into their own in a time slot where really nobody cared much about what you did as long as it didn’t mess with Johnny. Elevator races, top 10 lists, viewer mail, Velcro suits and Larry Bud Melman soon became television staples. What today’s generation of late night viewers take as standard operating procedure was, at the time, an inventive and modern twist on what Steve Allen and a few others had done in television’s infancy. But Dave made it ours. I was standing in my kitchen one Friday evening in the 80’s and The Tonight Show had ended another program. In a cold open, for the next show on NBC, we see a shot of the Grateful Dead’s Jerry Garcia in his dressing room with a guitar trying to play a song but not getting it. In walks David Letterman who reaches over, adjusts Jerry’s fingers on the guitar. After which Jerry proceeds to start strumming “Proud Mary”. It was hysterical. I was hooked. I had MY Johnny. Through college my roommates and I always watched Dave. The NBC debacle between Dave and Jay was high drama for me (for no good reason except my peculiar fascination with the situation) and I was so pleased when Dave got the CBS deal. I have been to a taping of the original Arsenio Hall show and Late Night with Conan O’Brien and even a rehearsal of The Tonight Show with Jay Leno. But I never made it to the Ed Sullivan Theatre. I guess watching on the TV (and avoiding the cow herding aspects of being in a long studio audience waiting line) was good enough for me. These final shows have been terrific mostly because Dave seems so relaxed that he’s almost like the old “Late Night” Dave. If you haven’t been watching them, you’re missing some great TV. None the less, I’m watching these final shows with the kind of sadness I should reserve for people I know – and in spite of the TV relationship, I do not know any of these folks. But I’m sad for them and me none the less. It’s the kind of end of high school “we will never pass this way again” thing we’ve all been through. I will be sadder than when I watched Johnny’s last show because Dave was my guy and he’s leaving. It may be time, but you never want to say goodbye even when you know you should. So Dave, you’ll never read this, but thanks. You are a broadcaster’s broadcaster and an excellent entertainer in your own right. BUFFALO, NEW YORK, May 4, 2015 – – Mother’s Day is one of the busiest gift buying times of the year, with the National Retail Federation noting Mother’s Day as the 3rd largest in terms of consumer spending. One of the most popular gifts for Moms (and Dads too) is money. So this year Western Union, a leader in global payment services, crafted a national radio campaign to remind grown-up children about the best service to make sure money gets to Mom. America’s Friendly Neighborhood Voice-Over Talent, Peter K. O’Connell, was secured as a voice talent for Western Union’s national radio campaign. America’s Friendly, Neighborhood Voice-Over Talent, Peter K. O’Connell, has worked with a wide variety of companies from around the world in addition to this most recent project for Western Union. Some of Peter’s clients include General Electric, Kraft Foods, PBS Television Network, Shell Oil, Pitney Bowes, Bacardi Rum, Highlights HIGH FIVE Magazine, Deloitte Canada, Rich Products, U.S. Army, Starz Cable Television Network, BlueCross BlueShield, SunSetter Awnings, Time Warner Cable, Harlequin Enterprises and Darien Lake Theme Park. Described as a natural born storyteller, Peter K. O’Connell’s voice-over productions have been heard globally in radio and TV commercials, medical narrations, television infomercials, political commercial voice-overs, TV network promos, e-learning narration projects (computer-based training, internet-based training and web-based training), PSA’s, message on-hold, as well as other video and media productions. Peter owns audio’connell Voice-Over Talent, a division of O’Connell Communications, LLC and can be reached via audioconnell.com. So here’s one profitable use of social media for your voice-over business. Next time you’re in Washington, D.C. for a quick family party trip, haphazardly go on social media, like Facebook, and stumble upon a post by voice talent Bill Lord. 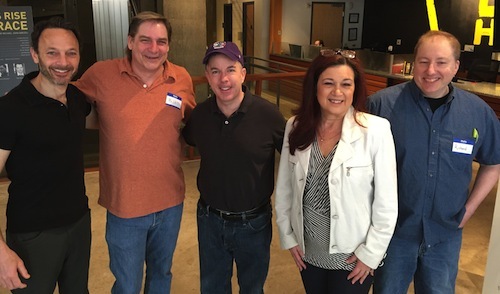 Bill’s post will tell you that David Goldberg from Edge Studios is hosting a voice-over workshop one Saturday morning at the Woolly Mammoth Theatre. Then just before all your family stuff starts for the day (which is the reason you’ve come to D.C. anyway) grab a cab from your hotel and go to the theatre and surprise the crap out of your voice-over friends attending the seminar. That sounds pretty profitable, right? As nice as it was to see everyone, it was even better to see the looks of confusion and happiness at my pre-seminar surprise visit. I didn’t stay too long out of respect for their schedule and mine but for me it was a happy confluence of events that allowed me to stop by and say hi to help them begin what I am sure was a very educational AND profitable day.